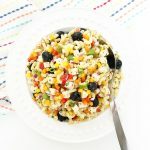 This Rainbow Pasta Salad is a perfect summer picnic or BBQ recipe! Made with a tangy, garlicky dressing, spicy Habanero with Cracked Black Pepper Monterey Jack Cheese and oodles of noodles and fresh vegetables. Boil the noodles according to the package directions. When the noodles are cooked, drain, then rinse with cold water, making sure to drain well again. Set aside. Combine the oil, vinegar, basil, oregano, parsley, garlic, green onion, parmesan cheese, and salt & pepper. Toss the noodles in the dressing. Then toss in the minced peppers, red and green onion, and black olives. Chill for at least 4 hours. You can also make this salad a day ahead. Make sure to stir the salad well before serving it, as the dressing tends to go to the bottom of the bowl. Right before serving, toss in the cubes of cheese. For best flavour results, this salad should be chilled for at least 4 hours (overnight works well too).